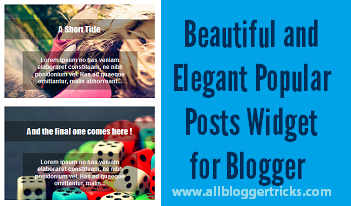 Ever wanted a really elegant and beautiful popular posts widget for your blogger blog? If yes, then you have landed on the right place. Today I am back with yet another unique and amazingly looking popular posts widget customization. I had my exams which ended just a couple of days before so I was thinking of something substantial to post. A image of this came to my mind and its here for all of you to use. So the widget I am going to add today looks quite different from the rest of the collection. You can see the demo of the customized Popular posts widget by clicking the button below. Once you have seen the demo, to add the Popular posts customized widget follow the given steps. Remember to check the Item Snippet and Image Thumbnail option. Also note that you have removed all the previous Popular Posts CSS codes (if any) before adding this one or the result will be the combination of the two. To add the JS, search for </body> and paste the below given code just above it. After adding the code save the template. PS. Remove the code in red if you already have it in your template. You are done now. Now you and your visitors can see this elegant Popular posts widget on your blogger blog. Also it is my earnest request to you that please do not remove the comments added in the codes. They will not be displayed in your blog. Only the person viewing the code can see this. Bro I had a problem with my blog that Google is crawling.my Blog labels also, due to which it shows duplicate meta description error. Please suggest me any solution? This can be done by editing the Robot.txt file.. Google for more info, there are quite a lot tutorials which will help you. Quite informative. Just wanted to drop you a quick note to say thank you for a great resource. I've been looking for a good-looking popular post widget for a while and I must say yours is the most good-looking one so far. I've applied it to my blog and I love the effect. Nice Tutorial.Keep sharing with us. To take it a step further, was wondering if I can change the date range? So choose my own dates instead of just 7 days, 30 days or all time. There doesn't seem to be any instruction out there on how to do it. Cool tutorial bro.. Thanks for share . Hope I will get benefited by this article Thanks a lot . Great and really cool widget!!! I love the look of this, but for some reason it is not working on my blog. I can get the standard blogger widget up but then none of the edits to change the look work. I followed the directions as written. Any ideas why it may not work? I figured it out, but now I can't figure out how to get rid of the bullets or dots in front of each thumbnail. Any ideas anyone???? I was looking for this ..
Is there a way we can customize your this one? Like change the font or color of the font? Now my problem is: I want the widget to be in my header area, so above my posts, but when I place it here the popular posts are still ABOVE one another. I want the pictures to be NEXT to eachother, how do I do this? I've customized the CSS a bit to make it look the way I want it. Now all I need to do is display the thumbnails along with their titles and descriptions NEXT to each other! I've tried adding float and what not but nothing seems to work. Can you please help me out here? thanx this is very helpfull for me.. Thanks for this tip!! love learning more about blogger! Hi, I love the look of this gadget, but it looks like a mess on my blog! Can you see what I did wrong? The post snippet does not show properly over the image. How do I adjust that? There are many popular posts widget, and one of them is like in this article. thanks for share. Snippets has already checked, but the not showing on popular post. how to fix this? @Anto Ramana - excelive First You See In you template whether there is predefined styles for popular posts widget if you have then delete it. Then you add this widget by following the tutorial. If you are not familiar with blogger coding then we will help you.